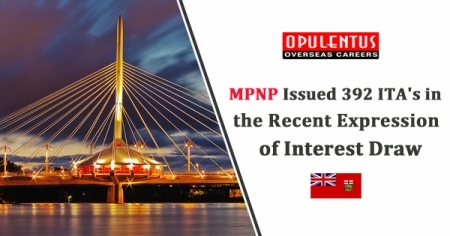 The Manitoba Provincial Nominee Program (MPNP) announced 392 invitations to apply for the Manitoba provincial nomination to skillful workers in the province and abroad in an invitation round that held on September 28, 2018. Of the 392 requests, 191 Letters of Advice to Apply (L.A.As) for a Manitoba provincial nomination given to applicants in the Stream of M.P.N.P's Skilled Worker Overseas. Applicants who got an L.A.A in this invitation round had the least score of minimum 679 on the M.P.N.P's evaluation grid, which allows applicants a score out of 1,000 depends on answers presented in their profile of Expression of Interest (E.O.I). Building an E.O.I profile is the challenging first step for anyone who wants to be judged for immigration by the Stream of M.P.N.P's Skilled Worker Overseas. Qualified applicants are then registered into the E.O.I pool, where they are placed upon the competition. A sum of 201 L.A.A's also was issued to Manitoba E.O.I pool applicants by the Stream of Skilled Workers in Manitoba who have a nearby relative in the Manitoba province, earlier Manitoba education or work experience, a least of six months current experience in a Manitoba In-demand profession, or the least language proficiency needed based on profession. The lowest-ranked applicant with these designations had a score of 592. An extra 31 invitations were announced to applicants by the M.P.N.P's Strategic Recruitment Initiatives. The least-ranked applicant issued an L.A.A by this process had a minimum score of 713. All invited MPNP applicants have 60 days to present a full application for a provincial nomination by their online account of M.P.N.P. Applicants whose appeal for a provincial nomination is recommended will be able to apply for Canada PR to Immigration, Refugees and Citizenship Canada. Please subscribe to Opulentus newsletters to know more information and updates about Visa and Immigration. Please take our free assessment from us to know whether you are qualified or not and also it will help you to know further options available to you.